Alphonse Marie "Fons" Rademakers (5 September 1920 – 22 February 2007) was a Dutch actor, film director, film producer and screenwriter. His 1960 film Makkers Staakt uw Wild Geraas was entered into the 11th Berlin International Film Festival, where it won the Silver Bear Award. 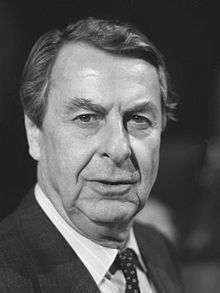 During a career spanning several decades he directed 11 films, including The Assault, which won the Academy Award for Best Foreign Language Film in 1986, and The Village on the River, nominated for the same award in 1959. Making him both the first Dutch director to be nominated and win this award. He died in 2007 in a Geneva hospital of emphysema, after the life-support machines were switched off at his request. ↑ "Berlinale 1961: Prize Winners". berlinale.de. Retrieved 2010-01-23. ↑ "The 59th Academy Awards (1987) Nominees and Winners". oscars.org. Retrieved 16 August 2015. ↑ "The 32nd Academy Awards (1960) Nominees and Winners". oscars.org. Retrieved 2011-10-27. ↑ "Dutch director Rademakers dies". bbc.co.uk. February 23, 2007. Retrieved 2010-01-23.